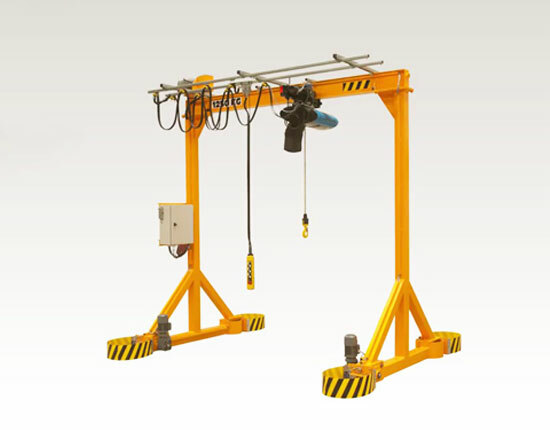 Shop gantry crane is a small and light duty gantry lifting system, widely used in shop, workstation, garage and warehouse to carry out light lifting jobs. This small gantry crane makes the material handling work in the shop effortless so as to greatly improve the working efficiency. Gantry crane for shop is typically designed on wheels, making it more convenient to lift and move loads. The portable shop gantry crane can reach every corner of working area to achieve a complete coverage. Ellsen shop gantry crane is available in many types, such as semi gantry crane, portable gantry crane, adjustable gantry crane, fixed gantry crane and telescoping gantry crane for both indoor and outdoor uses. 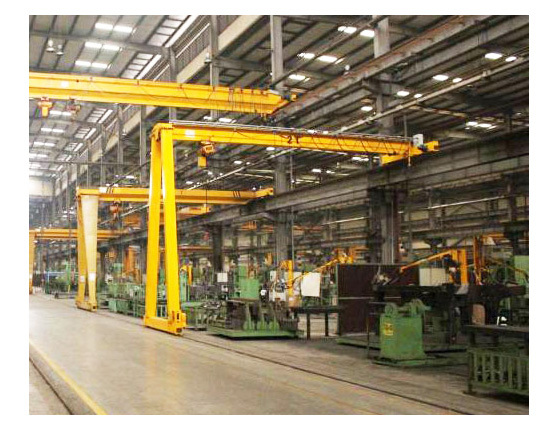 For indoor use, we also provide shop overhead crane according to your specific needs. Our shop gantry cranes are all fabricated in accordance with design and manufacturing standards as well as under strict quality control, thus we can ensure a quality gantry crane for your shop. 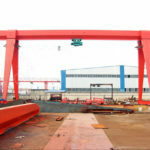 When looking for a gantry crane for shop, you should first get to know gantry crane types and their differences. We produce several main types for your applications. Portable shop gantry crane is widely applied in shop for its easy and convenient operation and high mobility. It can be made of either steel or aluminum with solid construction. The small gantry crane can move from one place to another readily, adaptable for various lifting occasions. Adjustable gantry crane is a more economical solution to lift and move materials in your shop. The adjustable height and span designs provide various gantry crane sizes to suit different working environments and lifting needs. The flexible structure allows the equipment to pass through narrow doorways or obstructions easily, and casters are equipped to make the movement more convenient. Semi gantry crane can be installed in your shop by utilizing facility structure. It is adopted when your shop space is limited. 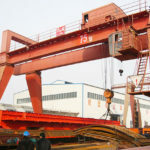 Compared with portable gantry crane, this shop made gantry crane travels along a fixed rail path mounted on the ground. 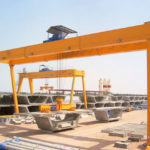 To determine the best gantry crane type and size for your shop, you should consider your specific lifting needs and working environment. 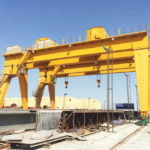 If you are unsure as to which type of shop gantry crane is suitable for your applications, we are willing to assist you to select the best lifting system so as to create the greatest value for you and save cost as well. Shop gantry crane is an economical material handling solution which can effectively accomplish almost all lifting tasks in your shops. It makes the lifting and moving of small and heavy items much easier. Here are reasons why you should adopt this gantry crane equipment for your shop. 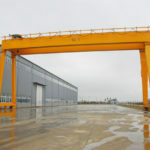 The shop gantry crane has simple structure, so it does not require massive assembly work, making the gantry crane installation and disassembly easy and quick, which can be done in just a few hours with one or two people. It also makes it easy to transport and relocate in other workplaces to achieve a wide range of applications. The mobile design allows shop gantry crane to travel anywhere within the working areas without obstructions. Different types of wheels are available to suit various ground surfaces. It is a more flexible lifting solution as you can choose either fixed or adjustable height and span designs to fit in different occasions. Shop gantry crane comes in various sizes and models to serve different needs of customers. It can cover the entire working areas freely to enhance production in your shop. 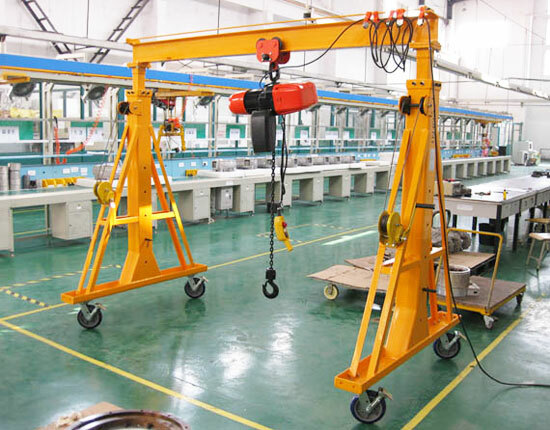 As a light duty gantry crane, this shop crane is usually operated by way of pendant control or wireless remote control. It is easy to operate and only requires one person to take the operation job. The small shop gantry crane is an ideal option for many small lifting needs due to the low cost and high performance. It requires minimal maintenance, and has long service life. Looking for gantry lifting systems for your shops? You can seek Ellsen for help. We are professional material handling equipment manufacturer and supplier, and are very pleased to help you make your own shop gantry crane plans. When making the gantry crane plans, you should first take several things into consideration, including your building structure like ceiling height, your crane capacity, lifting height, span, and working conditions such as frequent or infrequent lifting requirement. After a thorough consideration, you can determine your shop built gantry crane type and model which will best suit your needs. Other options for gantry crane components are available for your individual needs, such as different types of casters, hoists and spreaders. The shop gantry crane usually costs less than other lifting solutions so it is very popular among small gantry crane users. The machine shop gantry crane we produce comes in various types, and we will provide the best price of each type accordingly. We have specialized in designing and manufacturing gantry cranes for over a decade and accumulated rich experience. 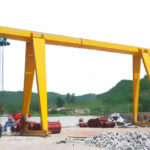 We supply many different types of gantry cranes to serve both small and heavy lifting needs, such as rail mounted gantry crane, rubber tyred gantry crane, container gantry crane and portable gantry crane. With regard to different applications, we will design the best solution to meet your requirements. We keep introducing advanced technology and processing equipment and strictly inspect each stage of production process in order to provide high quality products for clients. Before package and shipping, the shop gantry crane will be tested in our factory to maker sure it is in a good and stable working condition. 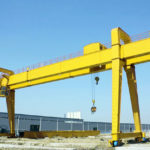 We also provide after-sale service for gantry crane buyers. Our skilled workers can help install the equipment at the site and ensure the crane in a normal operation. In case of equipment failure, we will provide maintenance service for customers. To learn more about shop gantry crane, please contact us now. We hope to cooperate with you in the near future.